Tuesday we celebrated Talker's 8th Birthday. Talker is the first dog I've ever own. I remember when my husband and I first started talking about getting a dog. We were recently married (May 2001) and thought what better way to solidify our relationship than to make a lifelong commitment to a dog. He had always owned dogs and was use to just having them around, but I had never owned one so the thought of getting one scared me but excited me. Around January 2002, I began doing my research on several breeds. Originally, I had wanted a Siberian Husky. I've always loved the black and white and blue eyes of a husky. But I knew since we were living in a condo and didn't have a backyard, that this breed would not be happy with its limited space. I attended several dog shows in search of a breed to my liking until one day my eyes were drawn to the beauty of the Basenji. It was a nice size--not too small but just small enough for condo living. It's face was strong, steady, and intense. Those Basenji eyes have a way of studying you instead of the other way around. I talked to several breeders and attended many other shows thereafter and I was still drawn to the Basenji. 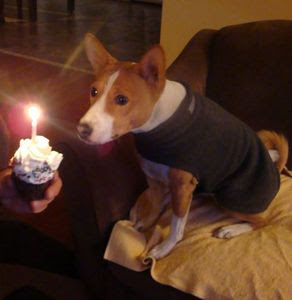 Six months later we finally made the decision to get a Basenji. 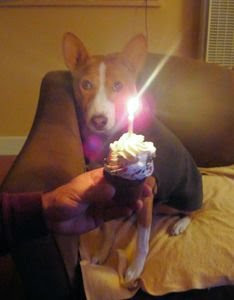 I began calling Basenji breeders in the area only to find that puppies were born the previous years and none were left. I was refer to a breeder in Joshua Tree that had been breeding Basenjis for many years and was well known and respected. She told me that she did have a 6 month old male. My husband had his heart set on a puppy but the breeder was insistent that he was all puppy and that we would fall in love with him once we met. So my husband and I took the 2 hour trip to Joshua Tree to meet this charming boy. When we got there she brought him out and he ran around and jumped up and down around us. He was so happy that he gave us a mighty yodel to express his happiness. That yodel found it's way to my husband's heart and he agreed that he was all the puppy that he needed. We took him home that day. The breeder had given Talker his name because she said he was the most talkative and he was -- and still is. He greets you with his yodels and chortles and when we "chat" the sounds he makes are almost like the sound of cooing birds. We had a tough two years with Talker but they were the best bonding years ever. No matter how much research I had done about the breed, I never expected it to be that difficult. He didn't like being by himself all day and he screamed like bloody murder in the condo. Basenjis don't bark -- which people are always amazed to hear -- but they do scream for hours when they are unhappy. Luckily, we found a doggy day care and for about 6 hours for four days a week we had to take him to doggy day care. He played for hours and after I would pick him up in the evening, he played with other dogs in an enclosed baseball field. When he came home he was happy, peaceful and tired. Talker went everywhere with us and he attracted alot of attention which made him become such a people friendly dog. He was easy to be with and our bond grew and grew. Talker has taught me the meaning of commitment. You would have thought that I learned the meaning of commitment when I got married but I think it still hadn't sunk in probably because I married late in life and had been on my own for many years. But somehow when I took on the responsibility of owning a dog the definition of commitment became more serious and meaningful. Because I chosed this dog I was now making a promise to him that I would care for him for the rest of our lives together. He, in return, would love me unconditionally. He would comfort me and warm my heart. He would give me so much laughter and tears. 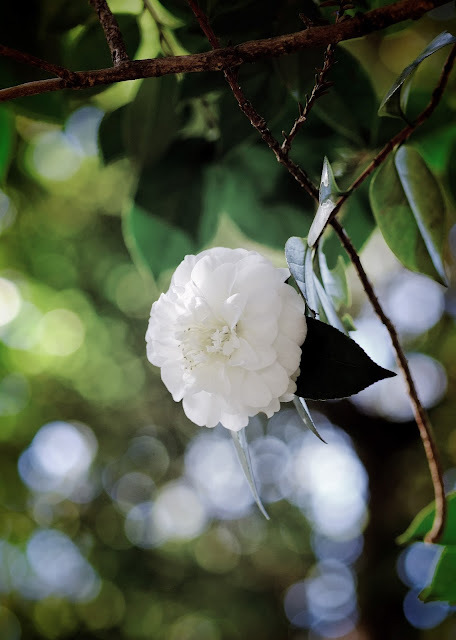 He would fill an unoccupied place in my heart for as many years as he could give me -- all of that he would give me just for the price of my love. What a deal I got when I met this beautiful Joy. Sometimes it saddens me to see him another year older because I cannot help but think he's another year closer to the inevitable. But I also rejoice at him being here and for choosing me and our family. I'm not supposed to be crying on Christmas Eve...am I? What a wonderful story of how you got Talker. You really have a special bond with him. 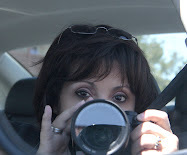 Birthday Hugs to you Talker!